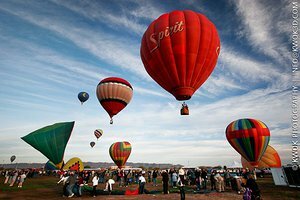 The Arizona Balloon Classic is Arizona's premier hot air balloon race & festival and the only race in town. 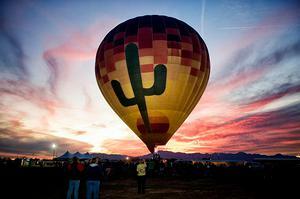 The Arizona Balloon Classic will consist of multiple "Hare and Hound" Hot Air Balloon races. Actual hot air balloon racing consists of multiple competitions in order to receive points to add to their total score which will determine who the winner of the "race" is. The "Hare" balloon leaves first and the rest of the balloons. The "Hounds" chase the "Hare" to the target. The "Hound" balloons are subjected to drop markers on to a large target on the ground. The closer the marker is to the target the more points are given. Sort of like darts from the sky, except you're moving where the winds take you. 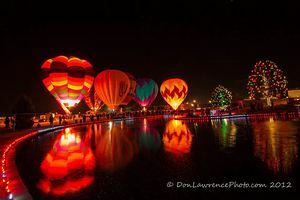 On Saturday and Sunday mornings, up to 25 hot air balloons will participate and partake in the competitions that are set up. Spectators and fans are encouraged to watch the hot air balloons as they participate in the "Hare and Hound" races. Races will be open to the public on Saturday and Sunday. Evening "Glows" on Friday night and Saturday night. NW corner of I-10 west to LA and Loop 101.